Pan-seared U-10 Scallops served atop tender arborio rice with parmesan cheese, sliced asparagus, roasted red peppers, wilted spinach and roasted garlic, garnished with fresh parsley. In a medium saucepot, heat up the vegetable oil over medium heat. Add in the onions, garlic, salt and black pepper, then sweat the vegetables for 1-2 minutes, or until they are translucent. Add in the arborio rice and cook for 1-2 more minutes to toast the rice. Deglaze the pot with white wine and simmer. Add in the chicken stock and simmer with the rice while constantly stirring until the liquid is absorbed by the rice. Stir in the parmesan cheese and heavy cream and continue to simmer while the parmesan melts. Fold in the roasted red bell pepper and asparagus. In a small saucepan on medium-high heat, sear the U-10 Scallops in the vegetable oil for about 1-2 minutes on each side, then remove from saucepan and reserve. Add the spinach into the saucepan and sauté for 1 minute or until wilted. 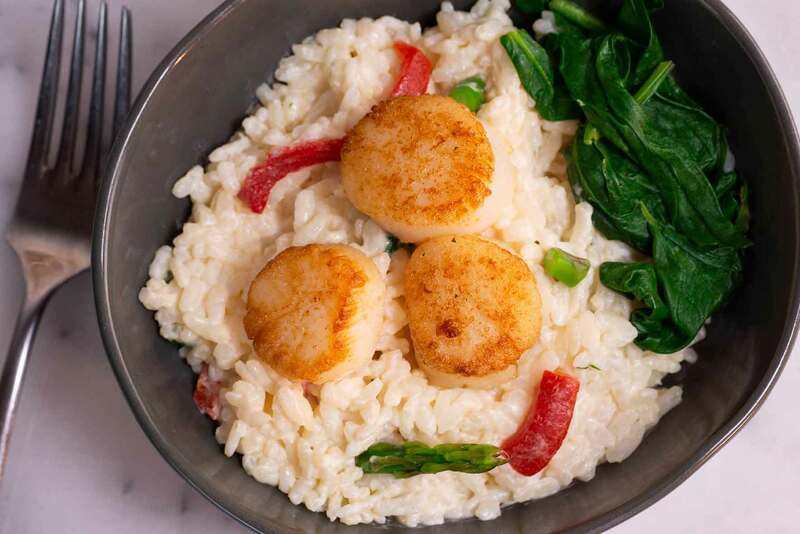 Top the risotto with the U-10 Scallops and wilted spinach, then garnish with parsley.